The other night I had the itch to bake. That happens every now and then. But this time I was going to use a bar/cake mix from Betty Crocker. Don't roll your eyes just yet, because A) shortcuts aren't always a bad thing and B) I had won a package at the pumpkin dessert contest a few weeks back and wanted to use it. And C) I'M SO GLAD I USED IT! It gets better. Keep reading. Are you getting hungry yet? So here's what I did and I started with having ZERO faith in this dessert. - I wanted to use up a box of unopened graham cracker crumbles and I wanted to make a different type of treat with them. I'm also a sucker for a buttery graham cracker crust. Can you sense I love cheesecake? But hold the phone, this is far from cheesecake! - I wanted to also the cake mix. 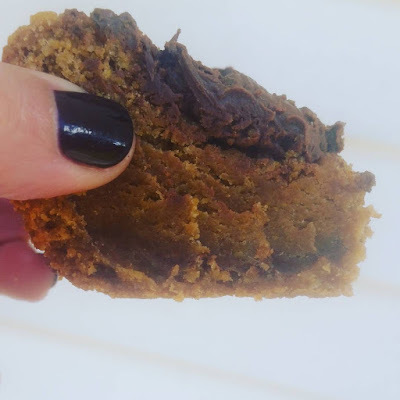 It's actually a bar mix and I have a feeling this is why this dessert actually turned out so good because the center is more dense like, well, a dessert bar treat. I baked the crust for 8 minutes at 350 degrees after I added 1 stick of melted unsalted butter to the mix and a 1/3 cup of granulated sugar, combined well. - I had the thought of letting the crust cool for a few minutes before topping it with the Nutella I had in mind but after mixing together the bar mix, an egg and 1 stick of unsalted butter, melted, ( yes, this has a lot of butter in it but it's worth any and all calories)!! I simply forgot and just started placing the bar batter on top. So it goes, crust, Nutella, chocolate chips, bar mixture, more chocolate chips and Nutella. 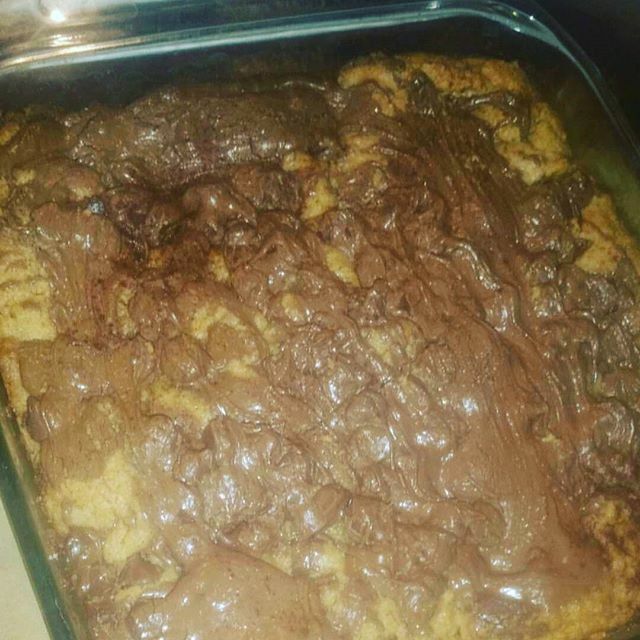 - I put the Nutella in the microwave for about one minute and it was melted just enough to spread more easily and swirl. By the way, I would use an 8x8 baking dish so you get a thicker bar. Bake for 25 minutes, test with a toothpick to make sure all is well and baked ( it will be, promise). Let it cool for at least 10-15 minutes and enjoy. I recommend dolloping with some whipped cream and a light sprinkle of cinnamon. Enjoy!! Sometimes when you have zero faith in something, it turns out to be the most glorious thing ever. That's one of the many funny things about life. I always do this mistake while baking my cake.Now I will make sure to avoid this mistake and would also write this on custom written essay website to help my readers.